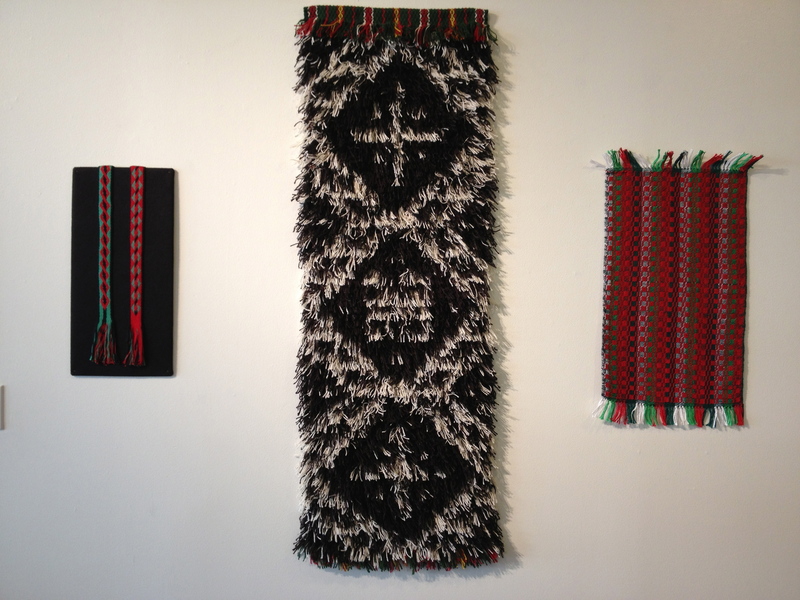 Thanks to the hard work of Jan Mostrom, Keith Pierce, and Robyn Meadows, “Everything Under the (Midnight) Sun: Scandinavian Weavings” is up! It happened just as in previous shows. All the pieces were assembled in one spot this morning and the giant puzzle of placing them appropriately on the walls began. Whoa! The orange of one piece makes a second one look terrible. Shuffling happens. Then, magically, three pieces look marvelous together, with a harmony of color of pattern that enhances them all. Maybe we have too many pieces. But wait! Jan’s tapestry looks perfect on the far orange wall. Keith and Robyn carefully measured the walls and the pieces, and used the level on everything. 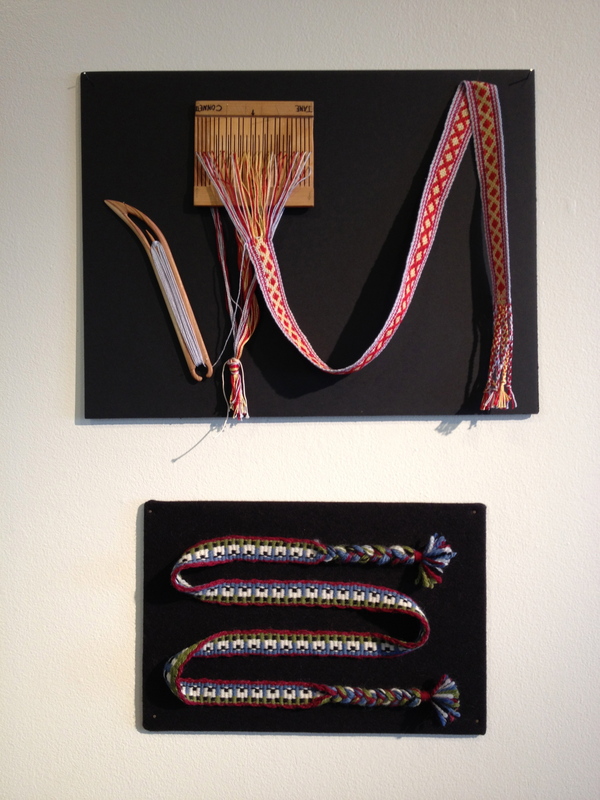 A few hours later, the pieces are nailed and tacked and shifted to the perfect positions, and once again the Scandinavian Weavers have a great show in place. Several bands are in the show, and they look smashing on black felt. One of Jane’s bands is still on the heddle, giving the viewers a sense of how it is made. Nancy Ellison’s “Band of Sheep” is below. 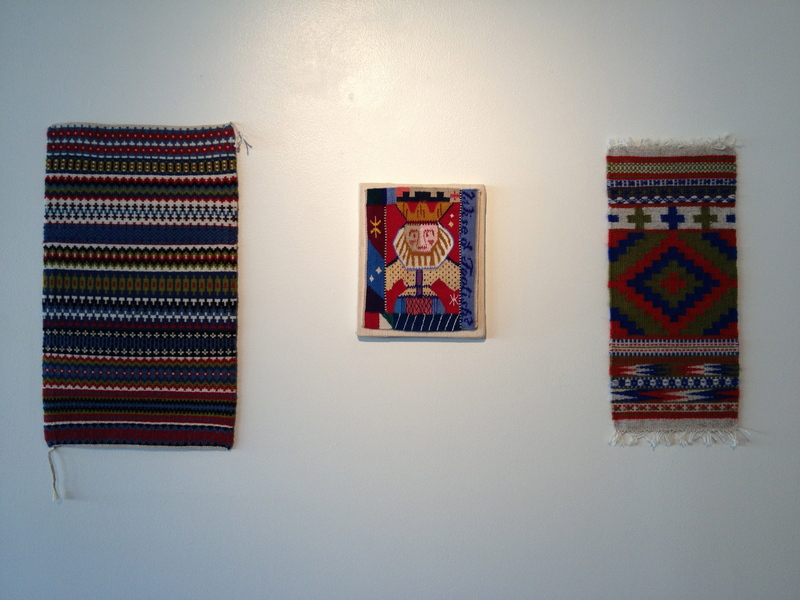 Two pieces by Melba Granlund flank a tapestry by Sharon Marquardt. What you don’t see is that they are above a blue sofa in a seating area, and the grouping looks as if it was custom woven for the space. The holiday red of Judy Larsen’s Monk’s Belt runner seemed too strong to hang near pieces with more neutral tones, but POPS with the black-and-white of Jan Mostrom’s rya and Keith’s Viking band.